Goldman: "The Fed Has Never Engineered A Soft Landing From Beyond Full Employment"
Looking at the coming 2019, Goldman's economists have retained their cheerful outlook and despite recent hints of an economic slowdown, they expect the Fed to tighten five times between now and the end of next year (4 in 2019 including once in December), lifting the funds rate to 3.25%-3.5%. 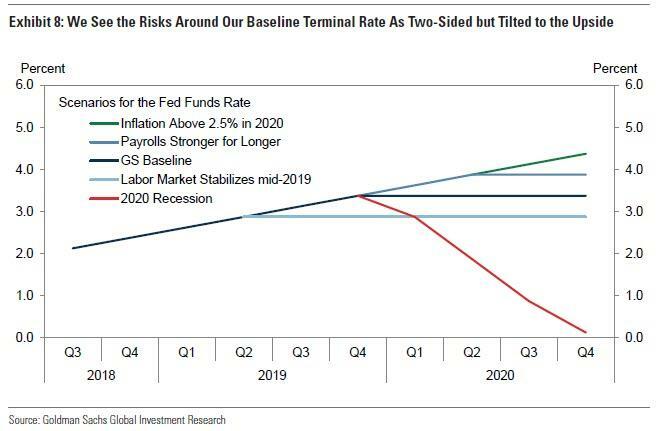 And since Goldman also expects 10Y Treasury yields to peak at 3.5% during 2H 2019 and decline to 3.3% in 2020, this means that it is Goldman's official forecast that "the 2s-10s portion of the yield curve will invert in 2H next year." 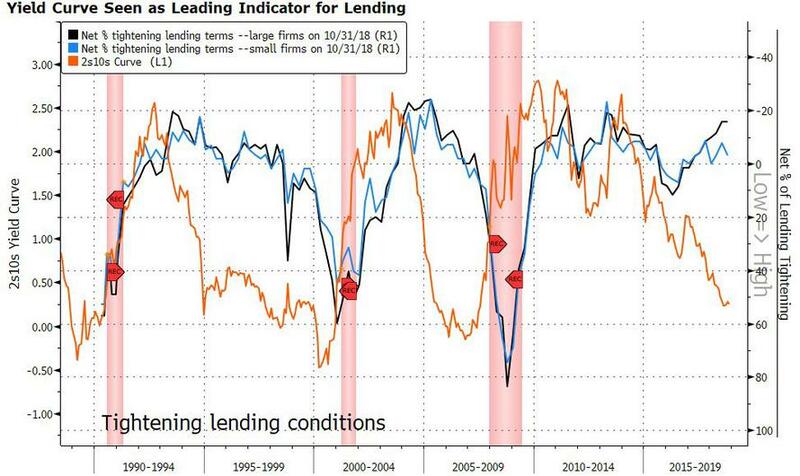 Inversion will likely be problem for the economy, and certainly for financial conditions. As the latest Fed Senior Loan Officer Opinion Survey (SLOOS) indicated, banks said that should the yield curve invert, they would tighten lending standards, as they would view a moderate yield curve inversion both as signaling a “less favorable or more uncertain” economic outlook and as likely to reduce the profitability of lending. 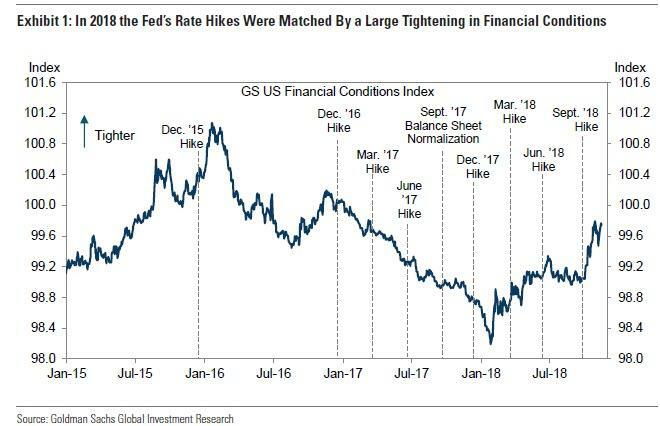 Which is why while Goldman remains an outlier when it comes to its projection for the number of rates hikes in the next 14 months, the bank now admits that in contrast to 2017, "in 2018 the Fed’s policy actions were matched by a large tightening in broader financial conditions." This tightening is only set to continue and may well lead to a "break" in the market that could force the Fed to end its tightening cycle, depending on whether or not the "Fed put" is triggered. The tightening in financial conditions and the fading of the fiscal stimulus are the key drivers of the growth deceleration we expect next year. Our estimate of the sum of the growth impulses from these two factors declines from a ¾pp boost in 2018Q3 to a ½pp net drag by mid-2019, as shown in Exhibit 2. While further escalation of trade tensions with China appears likely, we have found minimal effects on the US economy so far and the next steps should have only a modest impact on growth unless they affect US business confidence and risk assets much more adversely than the trade war has to date. Yet while Goldman expects GDP to taper in the coming years, this will only affect the labor market with a substantial delay. According to Hatzius, "robust job creation should push the unemployment rate to 3% by early 2020, well below our 4½% estimate of full employment, the rate consistent with 2% inflation." 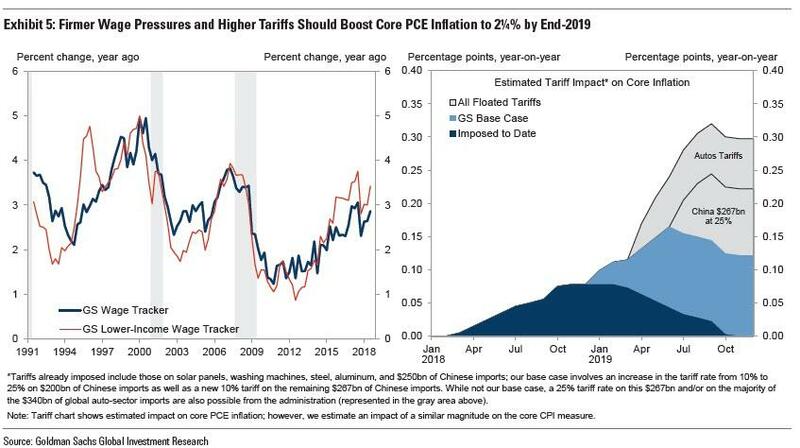 Which is why wage growth should reach 3¼-3½% in this environment, and firmer wage pressures coupled with additional tariff rounds should boost core PCE inflation to 2¼% by end-2019. And while Goldman believes that Fed officials would be comfortable with inflation at that level, the bank also sees a risk of a more material inflation overshoot. With growth likely to remain above potential a while longer, the impressive recent momentum in job creation is likely to fade only gradually. Monthly payroll growth has averaged 215k over the last six months, and our statistical models suggest that it is unlikely to slow to our 90k estimate of the breakeven pace—the pace needed to stabilize the unemployment rate—until early 2020 (Exhibit 4, left). By then we expect the unemployment rate to have declined to 3%, well below our 4.5% estimate of the full employment rate consistent with the Fed’s 2% inflation target (Exhibit 4, right). Goldman's bullish take on "one of the strongest labor markets in memory" is supported by various other indicators: the number of job openings per unemployed worker, the quit rate, household reports of the ease of finding a job, and employer reports of the difficulty of finding workers all suggest that workers’ bargaining power has increased. based on these signals, recent acceleration in the highest-quality wage indicators, the rise in our wage survey leading indicator, and the larger pick-up in wage growth in the more cyclically-sensitive lower half of the income distribution, we expect overall wage growth to reach 3.25-3.5% next year. Rising wages will also impact overall inflation, with core PCE likely to grind higher next year as well according to Goldman, which notes that despite recent "soft inflation readings" the bank expects PCE to reach 2¼% by end-2019 as measures of the underlying inflation trend have risen, "and in the year ahead pass-through from firmer wage growth, bottlenecks and capacity constraints in product markets, additional tariff rounds with a greater focus on consumer goods, and new state-level online sales taxes should all put upward pressure on core inflation." Meanwhile, Goldman notes that one of the reasons why the Fed will be especially cautious on the inflation front is that "inflation risk is always higher than it seems", especially in light of the upside risks from trade war escalation beyond a baseline forecast, which would include the imposition of auto tariffs, while the bank's analysis of city-level data leaves open the risk that extremely tight labor markets "can and often do push inflation notably, not just slightly, higher." 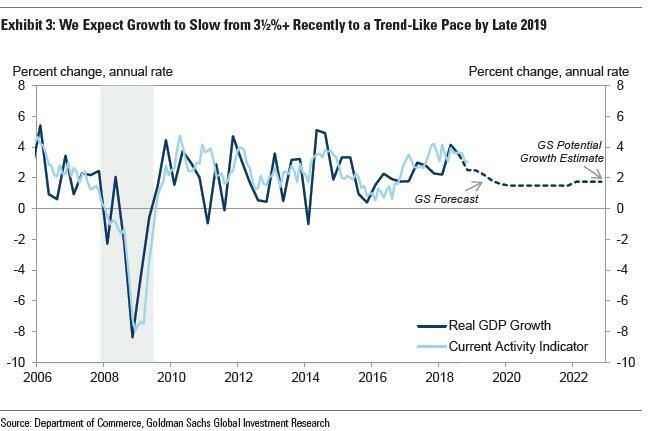 Summarizing the above, looking at 2019 and 2020, Goldman sees an economy in which GDP growth is slowing, but where the delayed afteraffects to the job market and inflation linger for a long time, and force the Fed to take tactical action. Which is also the biggest risk. We have noted that the Fed has never engineered a soft landing from beyond full employment, that few other advanced economy central banks have either, and that countries that have achieved very long expansions often used countercyclical policy to prevent a large overshoot in the first place. In practice it hasn’t been easy to nudge up the unemployment rate just so. The key difference with the past is that the Phillips curve is flatter and better anchored on the Fed’s target today. As a result, where labor market overshoots once led to high and accelerating inflation and consequently had to be unwound urgently with a forceful policy response, today an overshoot will more likely mean inflation persistently but only moderately above target. The Fed could probably live with this for a while, permitting it to tighten gradually and unwind the overshoot slowly. This gives the Fed a good chance of beating the historical odds. So while conceding that all else equal, a soft landing is now impossible, Goldman leaves off on a positive note in analyzing why recession risk remains stubbornly low as we turn the page on 2019. The history of US recessions points to two classic causes of US recessions, overheating and financial imbalances. While overheating risks could emerge down the road, they look quite limited for now: core inflation is at 2%, trend unit labor cost growth is at 2%, and both household inflation expectations and market-implied inflation compensation are below average (Exhibit 9). We also see little risk from financial imbalances at the moment. At a high level, the private sector financial balance—a very good predictor of recession risk—looks quite healthy (Exhibit 10). Digging deeper, our financial excess monitor looks for elevated valuations and stretched risk appetite across major asset classes, and for financial imbalances and vulnerabilities in the household, business, banking, and government sectors. Overall, the message is mostly reassuring. On the valuations side, while commercial real estate prices look somewhat frothy, lending terms and standards have tightened in recent years. On the sectoral imbalances side, fiscal sustainability remains a long-run concern, but we see this less as a recession trigger than as something that could prolong a downturn if policymakers perceive a lack fiscal space to respond. 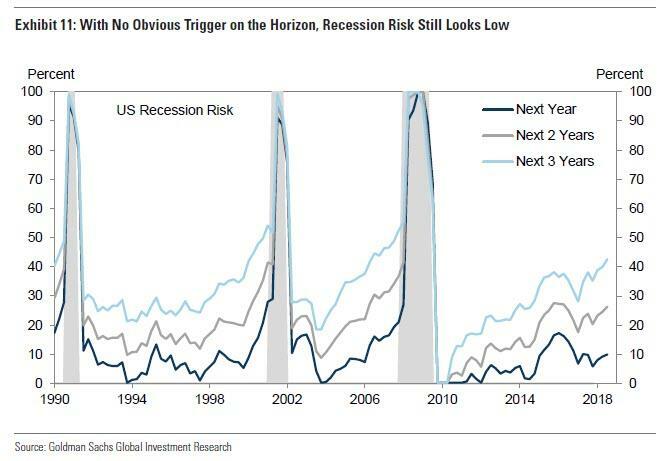 Finally, having dismissed both "overheating" and "financial imbalances" as imminent economic threats, and thus unlikely to trigger a recession, Hatzius tells Goldman's clients that "the most obvious recession risk beyond 2019 is a mundane and technical one." With a low potential growth rate and a possible need to operate the economy a touch below potential to gradually unwind the overshoot—we forecast 1.5% growth in 2020 and 2021—the likelihood that normal fluctuations will tip growth negative is mechanically somewhat higher. We would interpret this as simply highlighting the arbitrariness of defining recessions as negative growth, rather than as a material rise in the unemployment rate. ... our recession risk model indicates that recession risk is still quite low (Exhibit 11). The expansion is therefore on course to become the longest in US history next year, and even in subsequent years recession is not our base case. 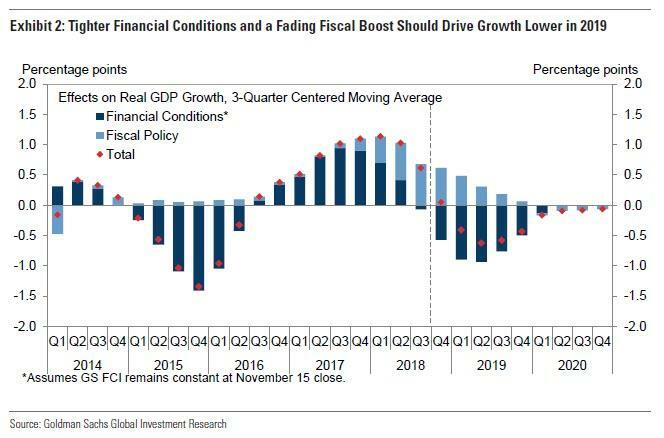 That said, with even Goldman admitting that a soft landing has never been achieved when the economy was in this condition, it conveniently provides the following chart to keep track of where across Goldman's various projections for 2019/2020 the US economy finds itself. Keep a close eye on the red line: it will be the only one that matters.